The sheepshead fish is a resident, deep-bodied fish with sharp dorsal spines that is commonly found in North and South America. The Texas flats are a favorite home for these interesting fish, and they are frequently seen by anglers poling the flats. The color of the sheepshead is usually green-yellow or gray, marked with 5-7 black bars that cross their body vertically. 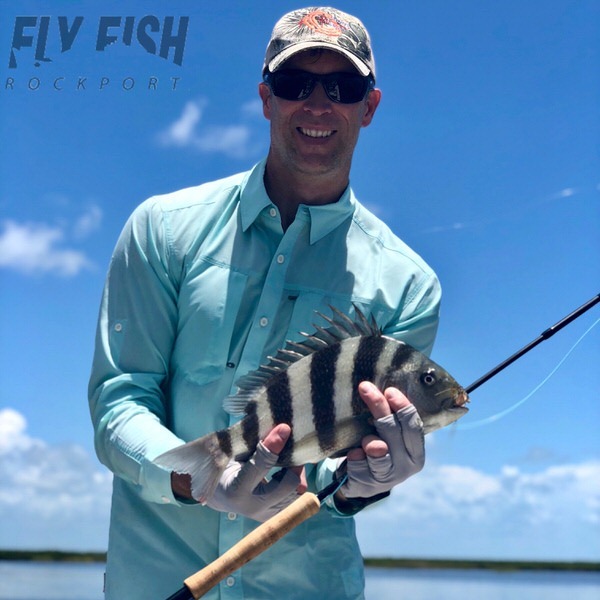 Sheepshead are exceedingly flighty fish and are hesitant to take a fly. One characteristic that Sheepshead are well known for is their teeth. When one looks in their mouth, they will find a set of teeth that eerily mirror a human’s! What are other names for a Sheepshead? Sheepshead are also known as Convict Fish, Baitstealer, among others. Sheepshead are common at 2-8 lbs but have been known to reach over 20 lbs! These fish reside in parts of North and South America. In North America, it mainly lives in areas from Cape Cod, Massachusetts through Florida, the Gulf of Mexico, and Brazil. Interestingly enough, there is a section of New York City named “Sheepshead Bay” after this fish, however they no longer are normally found in the waters that far North. 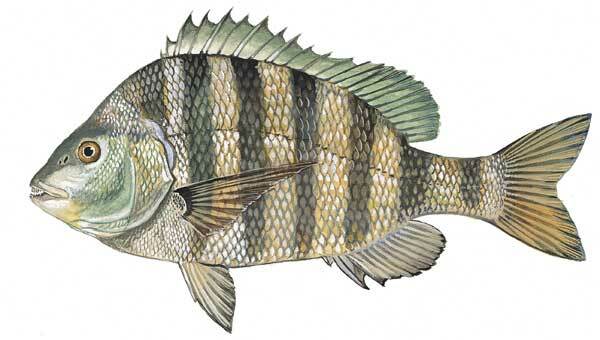 Sheepshead usually are found in saline to near-freshwater estuaries. These fish seem to appreciate structure or topographic relief and can be found near oyster reefs, piers, rock jetties, and breakwaters. These fish are not known to be migratory, however they often move to offshore spawning grounds when the water temperature dips in late fall and winter. Sheepshead have a diet that can be varied depending on region and availability. In Texas they are known to eat mostly algae, plants, and a few crabs. In other areas their main sources of food can be diverse, including mollusks, barnacles, crustaceans, fish, and more. 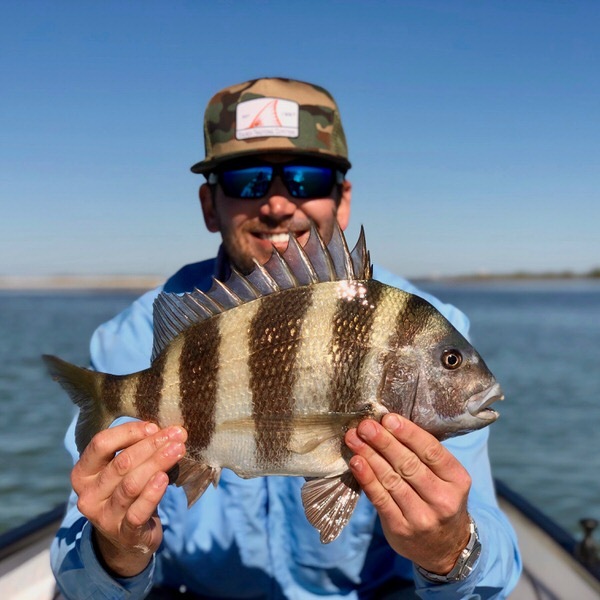 Are Sheepshead targeted by anglers? These fish are quickly earning their place as a worthy target by many anglers. In fact, sometimes they will even be referred to as “Texas Permit”, or “Convict Permit”. Usually, for fly fisherman, they are an added bonus on a day when out seeking Redfish (hyperlink to that page?) or other more common sight fishing favorites! However, they are proving to be notoriously difficult to catch. 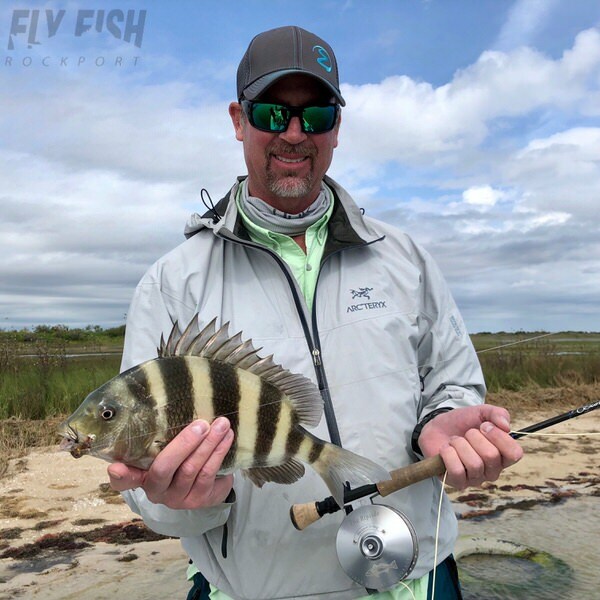 LIke many favorites of fly fishing, Sheepshead require patience, technique, proper presentation, and the perfect fly. However, the challenge makes the reward of landing one even sweeter!